Pot Mountain and Siwash Creek Click on the image to enlarge and zoom. 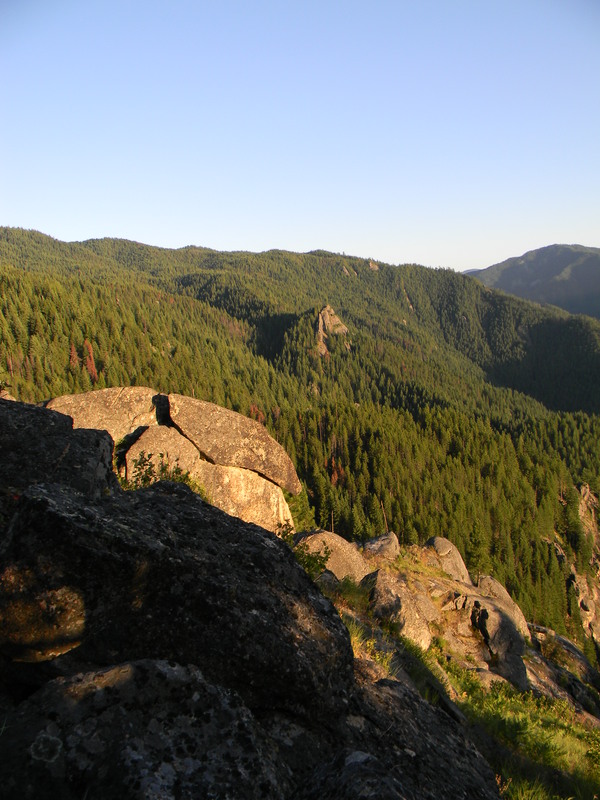 Pot Mountain Roadless Area spans 51,000 acres and is thirty-six air miles from Orofino, Idaho. Seven major peaks punctuate the skyline; the area’s namesake, Pot Mountain, crests at 7,130 feet. Four cool, crisp mountain lakes dot the high elevations. Rushing streams race from the ridges down to the valley (Chateau Falls plunges sixty feet) where the North Fork of the Clearwater creates a southeast boundary. Together with intriguing rock formations, the steep terrain is a vast diversity of vegetation. Two-thirds falls within a cedar-hemlock-pine ecosystem flush with Western redcedar, Douglas fir, grand fir, and interspersed with slender copses of birch. The higher elevations largely support the remaining third: dense stands of mountain hemlock, subalpine fir, Engelmann spruce. Most of the timber is relatively young, telling the story of extensive fires in the early 1900s that scorched the land and created sweeping brush fields, particularly on south facing slopes. 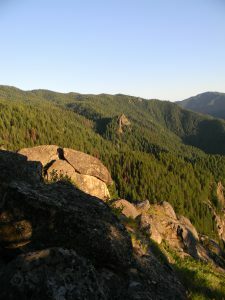 Under the moist, shady bowers of the generative trees, the lightly-treading explorer might find Idaho kittentail, Constance’s bittercress, and spacious monkey flower (endemic to Idaho), clustered lady’s slipper, Bank monkeyflower, and deer fern, all sensitive plant species in this region. Thanks to diverse habitats, Pot Mountain supports a spectacular array of wildlife. Approximately 16,000 acres of vital big-game winter range augments elk, mule deer, black bear, and Rocky Mountain goat populations, as well as a plethora of species common to the rest of the forest. Of the rare species, northern goshawk, marten, fisher, wolverine, lynx, and Bull trout have been documented. Where there is prey there are predators, demonstrated by the multiple unconfirmed sightings of grizzly bears. The rugged and furrowed slopes of this roadless area provide wildlife protection from human activities but also allow the thoughtful explorer a sense of solitude amidst steep ridges and dense vegetation. Hiking, primitive camping, backpacking, photography, horseback riding, hunting, and lake fishing for cutthroat trout draws visitors to this stunning country. Of the more than two-dozen cultural heritage sights recorded here, five speak to the indigenous importance of the land, including Native American campsites, a vision quest site, and a major trail that still exists along a currently used path. Logging and roading adjacent to the area has created severe environmental damage. Swaths of clearcuts leave the steep slopes highly susceptible to erosion and mudslides. 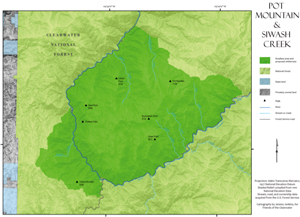 The Clearwater National Forest Travel Plan (2012) allows for motorized use in the area: off-road vehicles and motorized travel damages vegetation, displaces wildlife, and accelerates erosion. As an integral part of the northern Rockies bioregion, extending from the Greater Yellowstone Ecosystem to the Yukon River country in northwest Canada, Pot Mountain is an impressive and crucial allocation for wilderness protection.